Inspiration in the Bleak Mid-Winter: A Whiff of Spring in the Air? Okay east coast and mid-western readers. Don’t kill me. Backs and muscles all around the country are sore and busted from a long winter of shoveling snow and scrapping windshields, and here I am talking about Spring. Meanwhile, Spring seems like a distant memory, something that happened before the earth fell into another notch in space, making winters endless. It’s almost like this is your new life now – Winter. Forever. What’s this odd thing called “Spring”? “Summer”? Didn’t I smoke pot with her at that Phish concert? Not sure I’ve heard of her. Winter is where I live now. Your fingers are numb. The temps are so fiercely, horribly cold – it’s not even cold anymore. It’s not even bitter or frigid cold. It’s gone from frigid to just…..”PAIN”. You step outside = Instant pain. Even the NYTimes weather symbol shows a red horrible thermometer to illustrate that this is the weather – “Painful”. It almost looks like an exclamation point, shouting at you. It’s not cloudy or sunny. IT’S PAINFUL outside!!! So, why do I hint at the concept of spring? This west coast dweller. Me, this Los Angeles sun bunny. Don’t be so sure about that. I left the badness of winter for LA precisely due to this weather. In fact, I’ll probably return east in the next few years to live out the last half of my life preserving myself like Rhoda Morgenstern who proclaimed, “I moved from New York to Minneapolis, where it’s cold…because I figured I’d keep better.” I’m planning on doing the same in verse. I miss New York, despite the bleak winter months. Yet, ol’ winter weary bloggers (those who love baseball anyway) – cheer up! This week was the week we’ve been waiting for! Pitchers and Catchers reported to spring training! Yes! The battery mates of MLB’s green, expensive and vast green fields. The crack of ball against bat. The thud of a pitch against a leather mitt. The smell of hot dogs and beer. The vision of The Wave making its way across the stadium by a group of fans one side, only to end when the other side near Shake Shack is totally OVER IT. Oh yes. And the hope of a world series. I’m a New York Mets fan. I have no hope for any post season baseball. But – you never know. The only thing I hope for is the promise of Mets Opening Day, and baseball to be had every night on my Apple TV. Not to mention – a hopeful visit this summer to Citifield in Flushing, where I can smell it all in. Which reminds me. I better get my MLB subscription going! 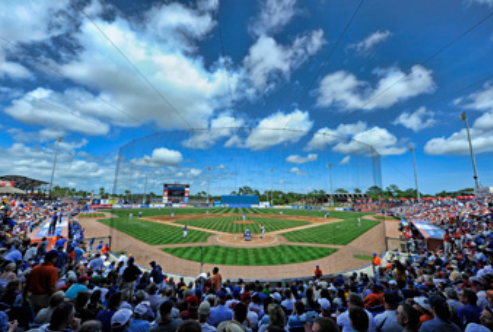 Categories: Baseball | Tags: Baseball, MLB, New York Mets, Pitchers and Catchers, Spring Training | Permalink. This was refreshing to read. As an East Coaster I’m really hoping for Spring to come soon, although this month is almost over. It’s nice to read something in relation to Spring. It’ll be another month before Spring comes, but you know how slow the seasons go in transitional phases. For my followers who live in the Mid-West and East Coast(if I have any from these areas) here’s something to keep you optimistic.